While perhaps not universally accepted, it is generally acknowledged that Ozzie Smith is the greatest defensive player of all time. With 13 Gold Gloves at the most important defensive position that doesn’t require extra equipment, his ability to generate outs was second to none. Back when we had few defensive stats, eight times Smith led the league in assists and still has the record among shortstops with more than 8,000 in his career. Omar Vizquel was not quite Ozzie Smith as a fielder. He did receive 11 Gold Gloves. He also played in 200 more games at shortstop than Smith, which is the record, and he’s third all-time in assists by a shortstop — around 700 behind Ozzie. Vizquel comes up on the Hall of Fame ballot a year from now, and he’s likely to be regarded as nearly, but quite, Smith’s equal as a defender. Being nearly as good as Ozzie Smith might be enough to get Vizquel in the Hall of Fame, given just how good Smith was, but there are considerable questions regarding Vizquel’s bat. Before we get to the offensive side of things, however, let’s take a slightly deeper look at the defense. There are those who choose to cast doubt on defensive metrics, and I will be the first to admit that Total Zone, which was in use before 2002, has its flaws. However, take a look at the list below showing the top-20 defensive players since World War II, in terms of how total career runs saved, including positional adjustment. Perhaps you might disagree with here and there with some of the names, or you don’t like exactly how the run values play out, but that certainly looks like a list of some of the greatest defensive players of the last 70 years. Any defensive list that starts with Ozzie Smith and Brooks Robinson is probably on to something. Luis Aparacio, Bill Mazeroski, Pee Wee Reese and and Nellie Fox are all in the Hall of Fame on the strength of their fielding. Generally speaking, the run values show the difficulty of a player has of separating himself on defense. On offense, there are 75 players in the same time period with at least 300 offensive runs above average, compared to five on defense. 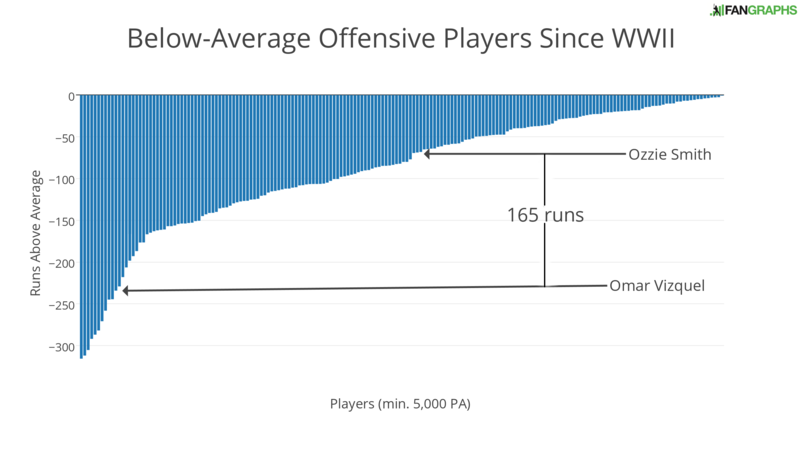 There are 157 who top 200 runs above average on offense, compared to just 13 here. A player has to be really good over a long period of time to crack this list, and Omar Vizquel was, coming up seventh. He’s ahead of a handful of guys in the Hall of Fame based almost solely on their gloves. There are more than 600 players to have recorded at least 5,000 plate appearances (roughly the amount it would take to get a player on a Hall of Fame ballot) over the last 70 years, including catchers, and Vizquel is in the 98.8 percentile in terms of value. The numbers above would say that, for every 10 runs Ozzie Smith saved, then Vizquel saved seven. A similar conversion would say for every 10 runs Vizquel saved, Alan Trammel saved seven. While those numbers seem right, let’s talk about Vizquel’s bat. Ozzie Smith’s slash line was .262/.333/.328 and Omar Vizquel’s was .272/.336/.352, which might lead one to the conclusion that Vizquel was a better hitter and better offensive player than Smith. That isn’t actually true, though, as Vizquel played in an offense-elevated era and, relative to his peers, Vizquel was actually quite a bit worse than Ozzie. 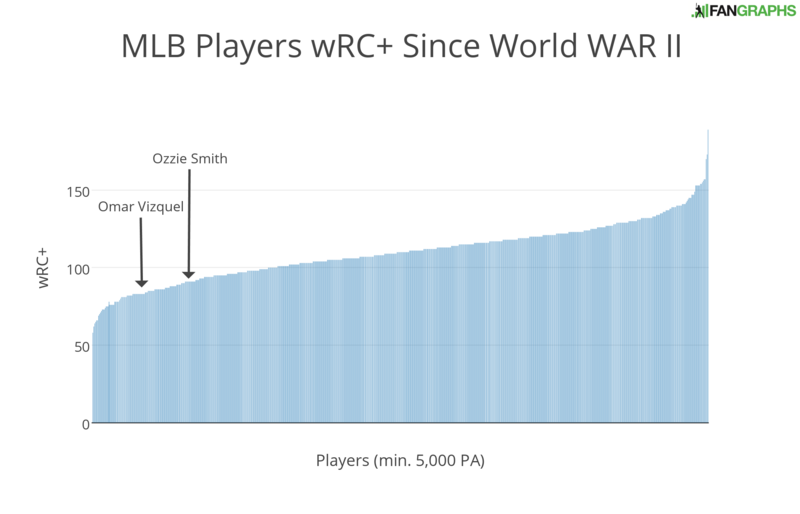 Looking at the 647 players to have recorded at least 5,000 plate appearances, we can see where Vizquel’s 83 wRC+ stands in relation to Ozzie Smith’s own mark. The easy conclusion is to look at that graph, and say both Vizquel and Smith were bad, pretty close together, and move on. Let’s not do that, though. We also have to consider that Ozzie Smith was really good at stealing bases, swiping 580 of them during his career while only getting caught 148 times (80% success rate). That adds wins to Smith’s offensive value. Vizquel stole a decent amount of bases himself, although his 404 stolen-base mark is 176 fewer than Smith’s — and Vizquel was actually caught more, 167 times, leading to just a 71% success rate. That meant that while Ozzie Smith was adding around three runs per year through steals, Vizquel might have been adding one. When we add in the steals, and then translate the difference between the 83 wRC+ of Vizquel and the 90 wRC+ of Smith, the numbers get a bit eye-popping. Of the 647 players from the last graph, around 180 put up below-average offensive numbers. Here’s that group of players translated into offensive runs above average (or, in this case, below average). Ozzie Smith was a vastly superior offensive player, outdistancing Vizquel by 165 runs over the course of their respective careers. For some context, 165 runs is roughly the distance between John Olerud and Reggie Jackson. Of the 143 position players in the Hall of Fame, the only player with a worse wRC+ than Omar Vizquel is Bill Mazeroski, and his election might have spurred the Hall of Fame to radically change the process of election. The only player elected to the Hall of Fame with a worse offensive record was Rabbit Maranville, and he comes within five runs of Vizquel. There have only been 11 players elected to the Hall of Fame who were below average offensively. Here are their numbers along with a couple other players similar to Vizquel. Aparicio made up some offensive value on the basepaths, leading the league in steals nine times with a very good 79% success rate. He also made the All-Star team in 11 seasons, made MVP ballots 10 times, and won nine Gold Gloves. Maranville had two top-three MVP finishes and made the ballot six other times. It’s hard to hold Vizquel’s three All-Star appearances against him, given the shortstop competition at the time, and he does have those 11 Gold Gloves, but it;s really difficult to ignore Vizquel’s batting line. If Vizquel had the greatest defensive numbers of all time, ahead of Ozzie Smith, his value due to that bat still comes in below Joe Tinker and well-below Pee Wee Reese. I don’t spend a lot of my time arguing against players for the Hall of Fame, but given the 10-ballot limit, a vote for Vizquel is actually a vote against a much more deserving player. It seems necessary to point out that Vizquel’s deficiency wasn’t a run-of-the-mill weakness. If elected to the Hall of Fame, he might be the worst offensive player there. There are players with poor offensive reputations in the Hall, but he is still well behind Ozzie Smith, Phil Rizzuto, and Nellie Fox. Vizquel’s defense was fantastic and, if he were even mediocre on offense, he would have a great argument for the Hall. If he were the very best defensive player of all time, he might have a decent argument for the Hall of Fame. Unfortunately for Vizquel, he was great, but not the greatest, on defense, and he was a very poor offensive player. In combination, he falls well short of the sort of value that accompanies a vast majority of Hall of Famers. We hoped you liked reading Omar Vizquel and the Worst Hitters in the Hall of Fame by Craig Edwards! My argument against him really boils down to, if you’re voting for Omar, who are you not voting for? Are you also voting for both Scott Rolen and Andruw Jones, vastly superior offensive players who were each among the greatest defenders at their positions? Edgar, who’s offensive runs above average mark is about double Ozzie’s DEF and who’s own negative DEF is about half as many runs below average as Ozzie’s OFF? Anybody with four open spots should either be adding someone they haven’t supported (Walker, Mussina, Martinez, Schilling) or adding the four newcomers (Chipper, Thome, Rolen, Andruw) who have excellent cases. I just don’t see the argument for Vizquel but against Andruw Jones. Andruw even had 8600 PA so it’s not like his career was as short as some others (it was essentially the same length as Edgar Martinez’ career), and he had an incredible peak including a 2nd-place MVP finish. Did not notice this before but I meant Omar in the Edgar paragraph. I’ve seen people say they are unsure if Beltre is a HOFer and I think that’s absolutely ridiculous. I hope they all see this table. To be fair, the arbitrary limit of 10 players on any given HOF ballot is a pretty lousy way to create a bar. Just because a period may be light or heavy on HOF talent should not mean less-deserving players should be voted for (to avoid a largely empty ballot) or ignored (because they fall short of others on a stuffed ballot, even though they deserve it). If you cannot fit in as many players as you think deserve your vote on a given year, there is no requirement that you then vote for the 10 most deserving people. Some voters leave off the MOST deserving people, when they expect that their election is a sure thing, and so make sure that every player he or she thinks deserves a vote gets recognition. 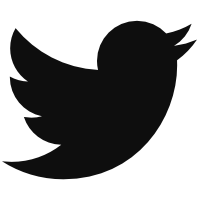 Working to deal with an arbitrary limitation yields imperfect results. So if someone, say, would rather vote for Vizquel than Larry Walker, whose performance and value is more debated and nebulous due to his Colorado stint, is that really a wrong thing to do? I say no. All that matters is, don’t give a vote to a person you don’t honestly thinks deserve it. If you think Vizquel deserves it, you are allowed to vote for him, no matter if it forces you to not vote for someone else who also deserves it. And if you think that’s wrong, don’t wag a finger at such voters; petition to do away with the 10 player limitation. I disagree that the linchpin of the argument against Vizquel is because there are so many other more deserving players on the ballot. While this is true, even if all those other players are elected, Vizquel seems below even the Jim Rice level of candidates. His career WAR is not only low, but he fares even worse when you look at peak value. Great player, but not Hall-worthy.